Japan is still a very good country to prospect for antiques in spite of its devouring modernity. When it comes to antique or even more homey tansu/箪笥, one should keep both eyes open as these Japanese-style chests can become extremely useful in any home because of their practical shapes and sturdy material, not to mention their aesthetic qualities. Even if you are here for a short stay or plan to leave soon, they can easily be filled with your belongings actually helping with the ever tiring chore of removal. Fine, Sir, but what is a tansu？Sorry, my good friend, I ought to have explained that a bit earlier! Tansu is the word for chest, chest of drawers or cupboard, all in one word in Japanese. It is often used in the West, notably in the antique business, to refer to traditional Japanese chests, handcrafted and made of fine wood. The latter is important when it comes to pricing. Most popular woods are Hinoki/檜 or Japanese cypress, Keyaki/欅 or Japanese elm, Kuri/栗 or Chestnut,, Sugi/杉 and Kiri/桐 or Paulownia. After all, it is a very vague term to describe a whole range of chests, but many collectors focus on finding antique Tansu. There are many workshops (especially in Shizuoka or other prefectures with a good supply of wood) in imitation of the classic antiques. Some are made of excellent reclaimed wood causing the new Tansu to retain a more aged look that some people seek. 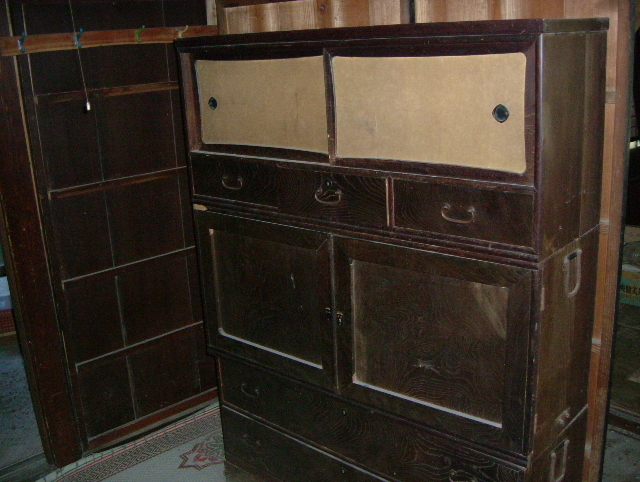 Make sure to ask first if the antique tansu is authentic or an imitation. But my bet, that is if you have the time, is to look around in farms and in the country where there are not only authentic, but cheap and serviceable. Moreover, people tend to be happy to get rid of them! Now, before you go prospecting, it always a good idea to acquire a little basic knowledge. One way to conduct a successful bargain! -Choba-dansu/著場箪笥/Merchant Tansu. Used by merchants, they display elaborate metal hardware and were used in shops to impress customers. They come in many sizes depending on trade plied by their owners: sewing supplies chests, sea chests, merchant chests, futon chests or kitchen equipment chests. They could either open from a single side or be accessible from both sides. -Kusuri-dansu/薬箪笥 were and still are apothecary/medicine chest. They were used to store herbs, especially at medicinal herbs/kanpoyaku/漢方薬 traditional pharmacists. They are often made of paulownia wood and have many small drawers. They make for the perfect chest for jewels, spectacles or other small collection object storage, or even display. -Kaidan-dansu/階段箪笥, or step-chests are another very popular collection item, although their initial purpose was of a totally different nature. They were actually used to avoid taxation on other areas of a home when taxes were levied based on the size of one’s home! When the tax collectors appeared on the horizon, home-dwellers quickly moved those chests under the stairs away from their eyes! When small, they make for great display chests at homes and shops. When big, their aesthetical and practical qualities can be combined to save space. -Katana-dansu/刀箪笥. These were used to store swords.They are long and low and often made of palownia to keep sword from rusting. -Mizuya-dansu/水や箪笥 or Daidokoro-dana/台所棚 used in kitchens for the storage of plates, utensils and food items. They usually include many sliding doors and drawers of full plain wood, or adjourned wood, the latter coming with mesh or bars. -Sendai-dansu/仙台箪笥. These are used to store kimomo and clothing. 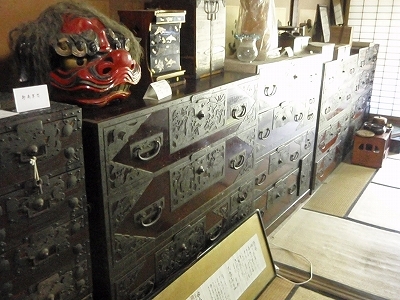 Originally made from the Sendai region, they are often made of zelkova wood with drawers lined in cedar. They usually come as one long top drawer with three slightly smaller drawers underneath. Some are true antiques as they were commissioned from former sword makers after the Samurai were disbanded in the Meiji era. -Cha-dansu/茶箪笥. They were used to store tea ceremony implements. This is one type of antique chest that can still be found in homes or in the country! Kakesuzuri/かけすずり, a small chest with a single swinging door and multiple internal drawers inside. Hangai/半外, a small chest for clothing storage. Cho-Bako/庁箱, or account box.. This last comes in many more types, a pleasure for collectors! 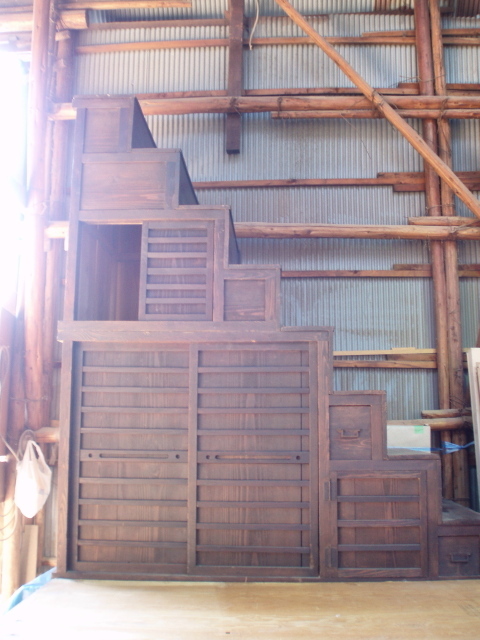 Many regions of Japan made tansu. Check where the former castle towns on the posts roads stood and you will have a good chance to make a discovery. Look for the ironware and quizz their owners! Wood and lacqyuer types are also clue to the origin of some pieces. The elements of antique tansu hardware were created from forged iron, and sometimes with copper. Search for design elements engraved or inlaid. Incidentally, black finish on the iron was created by applying rapeseed oil to the hot metal.